It’s funny how inspiration can come in the oddest moments. I bought some coconut cookies at Trader Joes and thought they were going to be soft and moist macaroons; what? Instead they were hard and crunchy. At first I was so disappointed, but then I thought, “these would make a really good cookie crust” – and inspiration struck! 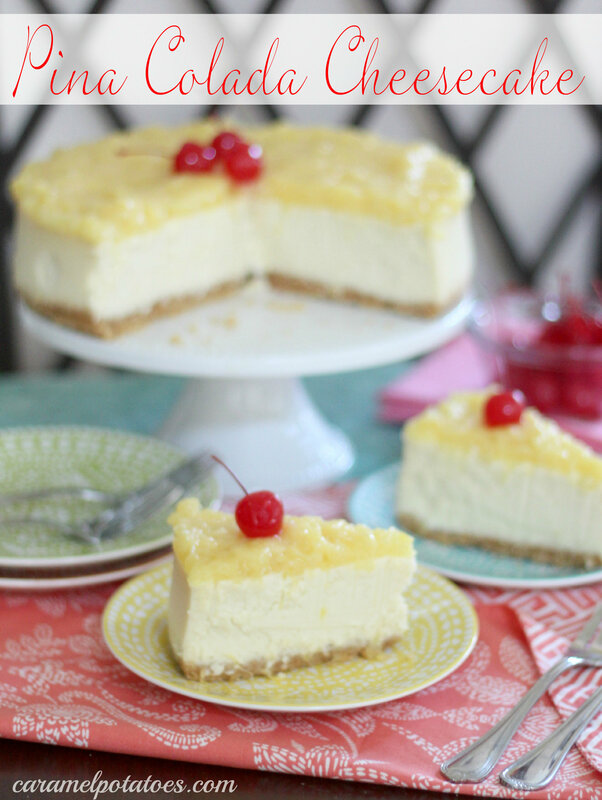 Pina Colada Cheesecake with a coconut cookie crust! The crunchy coconut macaroons do make a wonderful crust. For the filling I went to my favorite cheesecake because it always comes out perfect. I made some changes, and added some coconut flavor, then topped everything off with a sweet pineapple topping. The results were scrumptious- a little taste of tropical bliss. Butter the bottom and sides of a 9 inch springform pan. (Optional: I use a parchment round in the bottom also so the cheesecake will come off the springform. Lightly butter the pan, add the parchment, then butter the top of the parchment.) Mix the macaroon crumbs with the melted butter until completely combined. Press into the bottom of prepared pan. Cream the cream cheese with sugar in an electric mixer. Scrap down the sides of the bowl. Combine the sugar and flour together and add to the butter and sugar. Mix well and scrape down the sides of the bowl. Add the vanilla extract and the coconut . Add the eggs one at a time, scraping down the bowl often. Add the coconut milk and cream. Important: Refrigerate overnight. – it won’t completely set up and taste wonderful unless you do. The next day make the pineapple topping. Combine drained pineapple with 3/4 cup of the juice in a medium sauce pan. Mix the cornstarch and sugar together and then add to pineapple. You can add one drop of yellow food coloring if you want a brighter presentation. Cook until bubbly. Remove from heat and cool completely. Spread over the top of the cheesecake – still in the pan. Return cheesecake to the refrigerator for at least one hour. Slice and serve with maraschino cherries. I love piña colada. I made your piña colada fruit dip for a party and everyone loved it! I’ve never made a cheesecake but I think I will try this one! Yum. I’ll be right over Haha. I could use a big slice of this about now.